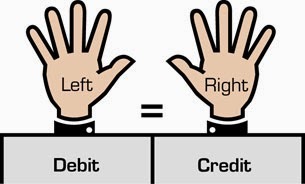 It's customary to write Debit on Left side and Credit on Right side in double entry accounting system. The difference between the total of all debits and total of all credits is the "Balance". The genesis of these words dates back to little over 500 Years and the credit goes to an Italian named Friar Luca-Pacioli. Debere meaning "to owe someone" : Short form "Dr"
(That's how "r" in Dr from Debere ). Later , these words got transformed in to ‘Debit and Credit’. Well, we all have Debit Cards and Credit cards. here is some Good Gyan.